These ideas on Press Attack are from the Xavier Men’s Basketball Coaching Newsletter. You can see their archives at this link. 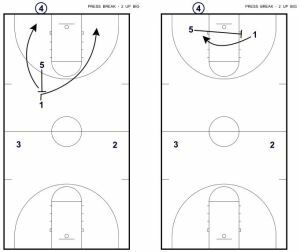 The initial part of the post are some ideas on developing your press offense philosophy. 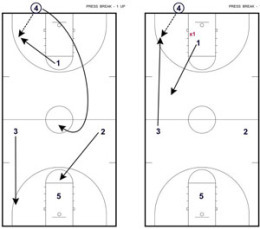 At the end are some diagrams with ideas for formations for your press offense. You have to believe in it so you’re players will trust it will work for them on their toughest nights. Do you simply want to safely break the back-court pressure or score as a result? Do you have a player that can beat double teams? Do you need to break the pressure with the bounce or the pass? Do you understand the intention of the defense that is attacking you? people you bring into the back court, the more players there will be to attack the basket. We have also witnessed over the years that the quickest way to keep a team from pressuring you is to get a couple of easy baskets. WAY less aggressive if they give up a basket. This has worked anytime we had a player (hopefully a point guard or a big player) who could invite double teams and safely get the ball out of the pressure. If your personnel is such that you CANNOT attack to score, then you need to have a philosophy of getting the ball safely out of the pressure so that you can execute in your half court offense. you can counter that by methodically breaking with the pass. Once you have decided what you are going to do, you must practice it. We have always used our second team to go against first team when working presses. This gives our team confidence that the ATTACK will work. We also NEVER run our PRESS against our PRESS BREAK for the same reason. There is nothing worse than seeing your own PRESS DEFENSE broken for lay-ups. 5-on-7 situations work well to create priority on crisp ball movement, cuts, and meeting passes. Make a team pay for pressing you. Awareness and preparation are the two biggest keys to keeping your team confident and calm in these situations. (Left Side Diagram) The most simplistic Press Break builds on the philosophy of only bringing as many players as you need into the back court. This one works great if you have a point guard who cannot be denied 1-on-1 or even 1-on-2. We clear out as much space as possible for the 1 to operate and space the other 3 players in the front court so that we can quickly attack the basket or flow into our half-court attack. We also teach our 1 to “post-up” to receive the entry pass. Once inbounded 4 gets to the middle on a J Hookcut to be used as screen or release pass. We allow our 1 to work the first three seconds of the five count before we go to the pressure release. Pressure release is to break the 3 up… this is a tough cut to defend… If the ball has not already been inbounded to the 1 it is because he is full fronted by his defender. We teach him to hold his defender off until 3 receives the inbounds pass. On the catch 1 sprints to the diagonal and there is no way the X1 can catch up to him. RED OPTION: If 2 goes to the corner, 1 rolls to basket. 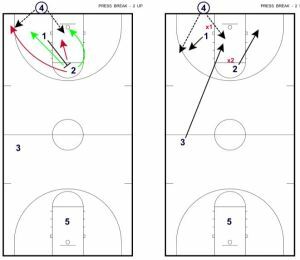 GREEN OPTION: If 2 goes to basket, 1 simply goes along the exact same line back to the ball. Again, if the defense does get 1 and 2 fronted, we break 3 hard to the basketball. 1 and 2 hold of until the catch. (Left Side Diagram) Another 2-up look we have used brings our 5 player up to help break the pressure as a lot of teams are reluctant to bring THEIR big away from the basket. 1 cuts off the 5 screen. 5 then comes right back to ball and is usually wide open if X5 has helped at all on the cut. 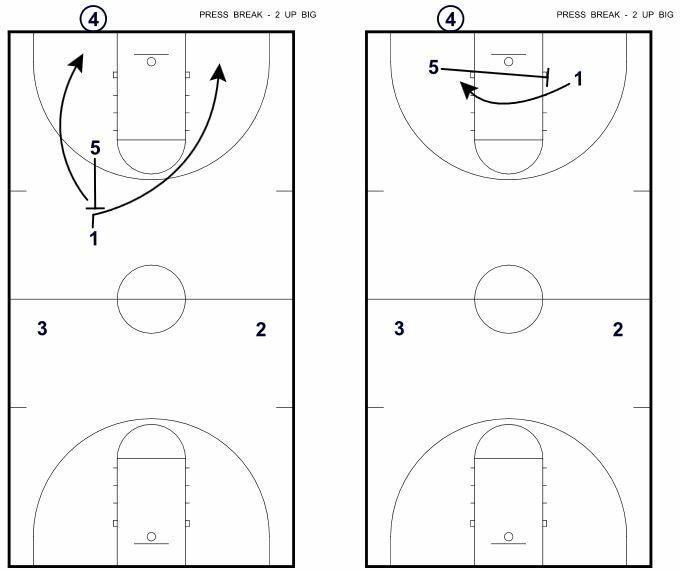 1 can get open every time by running NOSE-TO-NOSE with the 5 player screening and making the proper read on defense. 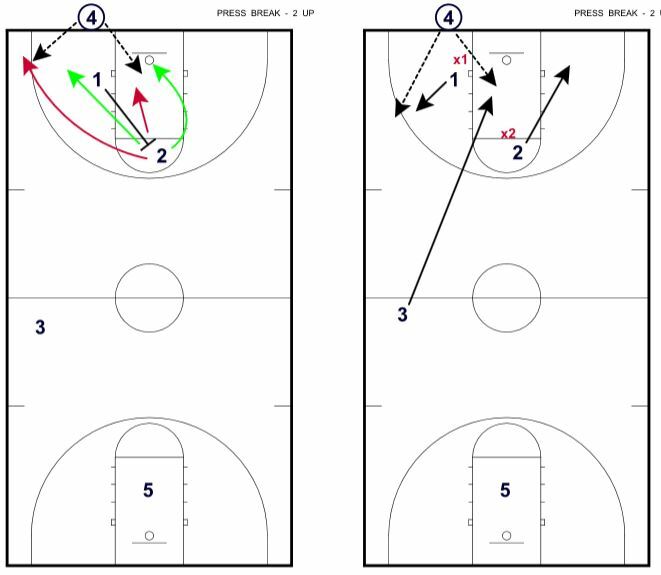 1 simple re-uses 5s screen… This is very difficult for a team to guard successfully two times in a row.